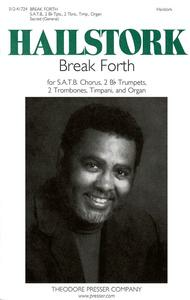 Break Forth composed by Adolphus Hailstork. SATB chorus. For SATB, Organ, Timpani, Tenor, Trumpet. Choral. Piano reduction/vocal score. Standard notation. 26 pages. Duration 7 minutes. Published by Theodore Presser Company (PR.312417240).With Standard notation. choral.